This was my speech I made late on Monday afternoon. 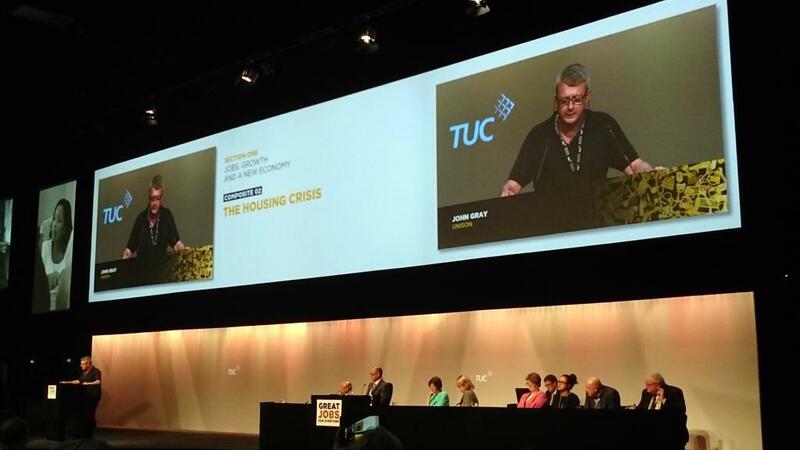 "Congress, President, John Gray UNISON moving Composite 2 on the Housing Crisis. Congress, housing is a fundamental human right yet successive UK governments have failed to ensure that its citizens are adequately housed. The result is that the nation faces a desperate crisis - an acute shortage of housing, overcrowding and homelessness. Decades of under-investment in housing have led to 1.5m fewer social and affordable homes for rent. This has pushed up rents and house prices and squeezed the incomes of citizens, with young people and families with children struggling to find a decent and affordable home to rent or buy. As a consequence of the housing crisis, the nation faces the huge task of building at least 250,000 homes every single year to meet housing demand, but less than half of these homes are actually being built. The shortage of social housing and the un-affordability of homeownership has also seen the private rented sector fail to deliver. We know that young people in particular have had a poor housing deal. Many of them are trapped in a cycle of expensive insecure, short-term lets in very poor and even unsafe housing. While Government cuts to housing benefits and soaring rents have left thousands of people facing a housing benefit shortfall and at risk of rent arrears, evictions,homelessness and widespread financial hardship. In London, where I am a housing worker, welfare reforms have led to the social cleansing of many families who have fallen behind their rent payment. In England, homelessness has increased by 9% since 2014 and across the nation, 1.6m children live in temporary housing. Congress, given the evidence that the number of social homes has declined dramatically, and given that the Government’s 2012 promise for 1-1 replacement of stock sold under Right to Buy has been broken, it is incredible that the Government has announced proposals to extend the Right to Buy to housing association tenants in England. This will mean a worsened housing crisis with less social housing available. The policy will also undermine the financial ability of housing associations to build and develop genuinely affordable housing, and it will also undermine the finances of local authorities forced to sell off ‘high value’ council housing to support the extension of the policy. Congress, given the deepening housing crisis - soaring housing costs, reduced benefits, and a depleted social housing stock - there is clearly an urgent need for housing policies that recognise the need for more social and affordable housing, not less. Government housing policies including ‘Right to Buy’, ‘Starter Homes’, ‘Help to Buy’ and ‘Pay to Stay’ do nothing to tackle the core housing problem, which is essentially a crisis of supply and affordability across all housing markets. Their policies will likely lead to the death of the social housing sector as they risk taking money from it to support limited homeownership and sub market renting - and as a consequence there will be fewer social homes at social rents available, leaving thousands of people on low and middle incomes struggling to find a decent home they can afford to live in. Congress, the solution. While UNISON is pleased that Jeremy Corbyn has just appointed John Healey as Shadow Housing Minister we can't just wait until 2020. The Government needs to significantly invest in housing now and commit to a national public housebuilding programme with local authorities and housing associations playing a significant role in its delivery to ensure we build the homes people need at prices and rents they can afford. This composite sets out a programme of work that will enable us to campaign for further measures to tackle the housing crisis. Such a programme makes sense economically. Building more homes of all types, will help create jobs and boost the economy. It will also reduce the cost of housing overall for everyone, leading to a lower Housing Benefit bill. It will ensure people have access to a decent and secure housing that will give them the stability and security they need to raise their families in strong local communities. Finally, Congress. It is the right thing to do too, the mark of a civilised nation is one that ensures that its citizens are adequately housed. Congress please support this composite. I move". This issue touched a nerve and there was a wide ranging and at times passionate debate on the composite which ended in Congress voting unanimously in favour.